Died: 25th November 1914; age 22; Died as a Prisoner of War. Brother to FREDERICK THOMAS BUGG. Frederick Thomas Bugg, 6, born Ipswich. Arthur was 18 years old, a Foundry Labourer. He was living with his parents & siblings. Arthur’s brother Sidney Charles Bugg, died in the Second World War. A Japanese PoW at Songkurai No. 2 Camp. He had worked on the Thailand – Burma Railway. Sidney died from Cholera on the 30th May 1943, aged 40. He was a Private, service number 5828171, of the 4th battalion of the Suffolk Regiment. After the war he was laid to rest at Thanbyuzayat War Cemetery, Myanmar. Soldiers’ Effects to Henry W. Bugg – father. Arthur is also remembered on the war memorial at Holy Trinity Church, Ipswich. The British army was in retreat, but at La Cateau it was decided to make a stand. For many troops exhausted from there march from La Harve followed by the battle and retreat from Mons orders were given to dig in, heavy guns brought forward in an almost a Napoleonic style stand against the advancing Germans. The 2nd Battalion left Dublin on the 13th of August landing in La Havre on the 17th being transported by train to La Cateau on the 18th The weather was hot and still they marched 8 miles to Landrecies from there they marched north to Belgium a further 17 miles arriving at Mons on the 23rd of August by the 24th the British army was retiring back to France the 2nd Battalion fell back to Hamin then to St.Waast by the 26th they were back to the outskirts of La Cateau. 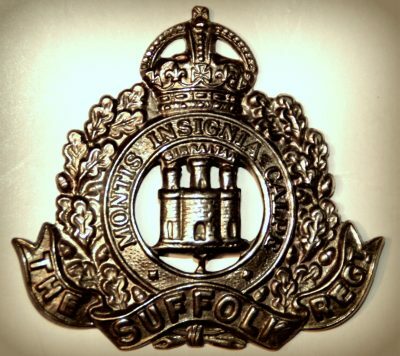 It is believed the Suffolk Regiment the 2nd Battalion recorded 720 casualties killed wounded and missing. 40, 000 British troop’s fort in the battle 7,812 British casualties 2,600 taken prisoner German losses were estimated 2,900. At this time trench warfare was in its infancy, trenches were shallow scrapes in the ground and most being shoulder high with little protection from bursting shrapnel shells. As the months moved on more time was taken in the preparation of the trenches and at this point steel helmets were not issued throughout the British army.